Smooths the source clip while retaining the edges. To adjust the parameters in this effect, first use the Show:Edges option to inspect which edges will be retained and adjust Edges Threshold, Edges Width, and Edges Scale until the important edges are fairly sharp and bright but not jaggy. 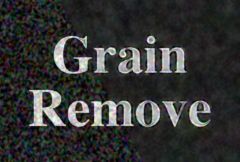 Then return to Show:Result and adjust the smooth parameters to remove the appropriate amount of grain. Smooth: Default: 0.1, Range: 0 or greater. The amount of smoothing to apply to the non-edge regions. Smooth Luma: Default: 0.5, Range: 0 or greater. Scales the smoothing amount for the luminance component. Smooth Chroma: Default: 1, Range: 0 or greater. Scales the smoothing amount for the chrominance component. Result: outputs the final result. Edges: outputs an image showing which edges are to be retained. Edges Width: Default: 0.02, Range: 0 or greater. The width of the edges to be retained. Edges Scale: Default: 0.25, Range: 0 or greater. The brightness of the edges to be retained. Edges Threshold: Default: 0.3, Range: 0 or greater. This value is subtracted from the initial edge image. Increasing it can help remove minor edges and speckles that should not be retained.